It's the show's third nomination in this category. WE ARE THRILLED TO announce that Cook’s Country has been nominated for Outstanding Culinary Program in the 46th annual Daytime Emmy Awards. Now in its 11th season, the Cook's Country television show has been bringing American classics, everyday favorites, and the stories behind them into households since 2007. "I'm thrilled that the show has been recognized by the Academy," Tasting Expert Jack Bishop said. "Bridget [Lancaster] and Julia [Collin Davison] are the two best cooking hosts on television. They explain how cooking really works so you can succeed at home. When they are paired with Bryan [Roof], Ashley [Moore], Christie [Morrison], and Lan [Lam], the recipe segments are just so informative and so fun. I learn something every time I watch the show, and I'm supposed to be an "expert" already!" This is the third nomination for Cook's Country; it was also nominated for Outstanding Culinary Program in 2011 and 2015. Members of the cast and crew will fly out to Los Angeles for the show on Sunday, May 5—days before many of them start filming the 21st season of America's Test Kitchen. Members of the Cook's Country cast and crew cheers during filming. "It is so exciting to have our show nominated!" Julia exclaimed. "I like to think of Cook's Country as the story of the United States, told from the food’s point of view. We’ve worked hard these past few years and it’s an honor to be recognized in such a big way." Cook's Country and America's Test Kitchen's director, Herb Sevush, was also nominated in the Outstanding Directing for a Multiple Camera Lifestyle/Culinary or Educational and Informational Program category for both shows. You can find the full list of nominees here. Bridget shared in the excitement and summed up the experience of working on Cook's Country. "What an honor to receive this nod and to be included in such great company," she said. "Of course, I'm a little biased, but I love our show. I get to cook with friends, talk about food and its history, and best of all eat some damn fine food. It all comes together easily when you work with a bunch of people that love what they do, and I think that's what really shines through." Tune in to the Daytime Emmy Awards at 5pm (PST) to see who takes home the win! 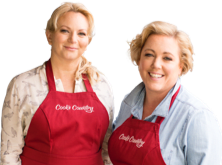 Want to know where and when Cook’s Country airs in your area? Enter your zip code into our station finder. You can also watch every episode of Cook's Country TV here.